Our house was burglarized two days before Christmas. Yep, what an absolute shock and violation. Home invasion is one of those things that you might not think will happen to you. It’s still surreal to even admit that it happened to us. I will save the whole story for another blog post, but for now I want to focus on how to feel safe again. Of course I would like to flee the neighborhood, the state, and move to an underground bunker located on a remote island, but for now I have to be more practical. Replace doors that have windows. We now have most of our doors with only small windows or none at all. Notify your neighbors. This can let them know to be more vigilant in their own homes and also keep an eye out for everyone around them. Install interactive devices in your home. Technology is evolving rapidly in this area. What was once a futuristic dream, is now a reality and actually more affordable than you may think. During my research on this I found a really impressive system offered by a builder. The Interactive Home™ by Taylor Morrison allows you to control your lights, home audio, and see who’s at your front door all from your mobile device. Install glass block windows in your lower level. They have attractive ones that have vents to still allow air in during nice weather. Glass block windows can be much harder to break or knock out for easy entry for a home invader. Report suspicious activity. There have been reports around this area of people knocking on doors. If you answer, they ask some random question. If you don’t, they proceed to the back of your house and break in. If anyone iffy stops by, just let the cops know. You don’t have to call 911, just give the local police a heads up. Get an alarm system. Obviously, this is a great idea. I would suggest doing so before a robbery occurs. It’s also not all that expensive, and can lower your home insurance rates. Get motion lights. This can help you feel safer at night. Most likely a burglar would turn away if a bright light shines on their path. Reach out for help. Honestly, I wouldn’t be surprised if some people experience some form of PTSD from this. Don’t be afraid to seek counseling or talk to someone to help you feel safe again. This is a work in progress for us. Never have I felt a feeling like this. Knowing that someone was in our house rooting through all of our drawers and personal things is the most unsettling feeling. I am trying to focus on the fact that it could’ve been a lot worse and that no one was hurt — “what doesn’t kill ya makes ya stronger” and all that jazz, but it will definitely take time. Have you ever been robbed? How did you make yourself feel safe again? Thanks for the tips. Even though we live in apartment and do not even speak to our neighbors, I am making sure all windows are locked and doors dead bolted when we leave. Sorry to hear, hope it did not disrupt you holidays. I would be completely freaked out if our house was robbed and unable to sleep. My heart goes out to people in that situation. Thanks for the important tips in how to make my house safer so it will not get broken into by a thief.. 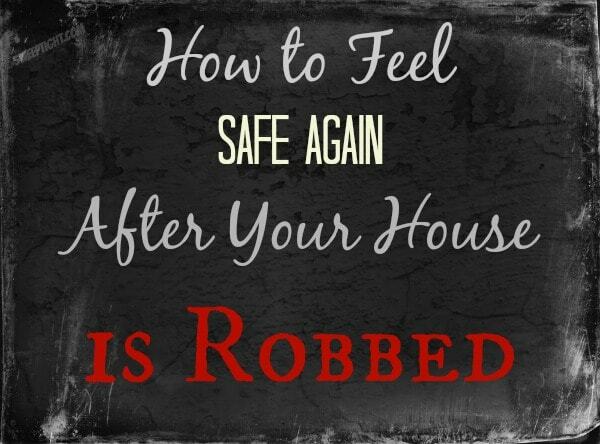 I am so sorry to hear about your house being robbed! How awful. There seems to be a lot of house burglaries where we live, and it is happening all the time. Anything I can do to make my house feel safer is always good! I have never been robbed, but a ‘friend’ did steal my camera right off of my kitchen table when we had a get together recently. Craziest thing ever. Hope you feel safer soon! We have a house alarm and I wouldn’t have it any other way. It doesn’t happen all that often, but when Chris goes away for work, I would not feel safe in my own home alone at night without one. my husband’s wallet got stolen out of his car. it was new year’s eve and we were planning on going out but never did so we forgot to lock it up at night. we have a house alarm that we use plus 3 dogs that are friendly but some people are just plain ole scared of dogs. we carry no weapons. i reported suspicious behavior this week when a suv was driving around our neighborhood. we have dead end streets and streets that are circles so you gotta be in our neighborhood for a reason. the police said they are allowed to be in our neighborhood but i still explained it was suspicious right after my husband’s car got broken into. we have a lot of theft in our city. Oh man, I’m so sorry to hear about this. We have not been broken into before. When we moved into our current home one of the first things we did was install an alarm system and we replaced our garage door that had windows with a solid one. We’re also planning on replacing one of the exterior doors we have that has glass panels with a solid door as well. These all sound like really great tips. I can only imagine how unsettling it must be to have your home broken into. My house was broken into (it’s been about 10 years or so) and it is CREEPY. I lost two or three pieces of rather valuable jewelry, which was upsetting, and some money, which was annoying, but I was very freaked out by the feeling that someone who meant to do harm (to my property, at a minimum) was in my home, in my bedroom, doing who knows what. It is beyond unnerving. My grandmother’s home was burglarized on Christmas Day (2012), when she went into hospice, so it was someone with knowledge of our family’s situation, as well as someone with a KEY. As you can imagine, that is unnerving to the nth degree, as it has to be a (formerly) trusted aide OR a family member. No matter HOW it happens, there are tons of emotions involved that you need to wrestle with. That being said, YES, I agree that you should be aware of your surroundings, be aware of your neighborhood, and be aware of strangers who exhibit suspicious behavior. HOWEVER, please do not allow yourself to become hyper-vigilant and paranoid and presume the worst of everyone. (I don’t mean you, Jen, I mean the royal “you.”) Of course, protect yourself, your property, and your neighbors…but don’t put yourself in a position where you’re crying wolf over every single person you see in your neighborhood who you don’t know. I found myself feeling that way after my apartment was broken into…where every time I saw someone turn the corner (we were the second house in), I found myself thinking that it must be someone coming to victimize me (or a neighbor), it must be someone up to no good, it must be “the guy” coming back for more, etc. I know it’s easier said than done, and it takes time to feel calm and safe and at ease, but you’ll get there. You’ll find the right balance between diligence and comfort/calmness. I totally agree with you. For the first few days everyone was “guilty until proven innocent” who would walk down our block. That feeling has already passed. I am not accusing anyone, but dang would it be great to know who it was!!! That is just HORRIBLE that someone would do that to your Grandmother in that situation. NOT that it’s ever excusable, but it gets me even madder when it’s toward the elderly. Oh my gosh, that is HORRIBLE. Horrible to happen any time of the year, but especially right before the holidays when you’re feeling peaceful. I’m sure these tips will help others out! thankfully this has never happened to me before. Scary! Great tips, I am big on house alarms! oh my goodness! I hope everything is ok. I am a big fan of motion lights. I told my Husband I would happily install them around my entire house. i’m so sorry this happened. i hate that there are still people in our world that feel like this is ok to do. sickening. Our home has never been broken into and my daughter STILL has anxiety about burglars. I can’t even imagine what it’s like for it to actually happen! I’m sorry this happened to you and thanks for sharing these tips. Holy cow!!! That is my biggest fear!! These are really great tips! The motion light one is awesome – they’d be nice to have anyways. Thanks for these great tips. I always worry about my house whenever I leave.